As a big rig driver, it’s common to get asked to reveal some of the craziest stories of other drivers on the road. Unfortunately, all too often there are many safety concerns when it comes to sharing the road with semi tractor trailer trucks that can make these stories more concerning than entertaining. For this reason, we’re working with everyday drivers to share some great safety tips that can be used when driving alongside bigger vehicles to ensure the safety of both vehicles. 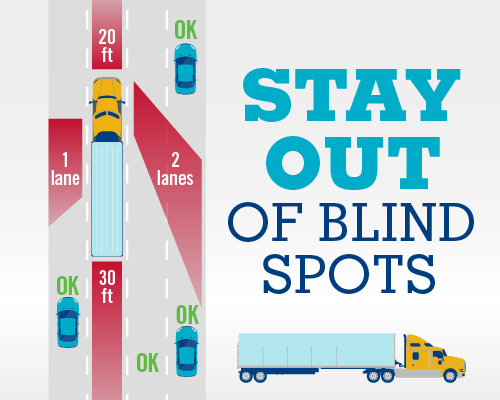 Dangerous driving around trucks starts with a vehicle being in the trucker’s blind spot. While there are several semi vs. car collision scenarios where a truck accident attorney can place the blame squarely on trucker negligence, many incidents begin with a motorist getting into the trucker’s blind spot. We’re sure you’ve experienced a moment where you thought it was a good idea to change lanes only to hear a horn honking and suddenly realize there’s a car coming up in your blind spot. In a larger vehicle, the blind spot can be even bigger. For this reason, it takes effort on both driver’s parts to ensure the blind spot is avoided. This means car drivers taking the blind spot into consideration and truck drivers taking a few extra moments to double check for cars before switching lanes. Passing big rigs may be a necessity from time to time depending on the flow of traffic. To ensure safe travels, it’s a good idea to first signal the turn. Give it a few moments and then start to pass. Be sure to maintain a consistent speed when passing a semi-truck. You never want to linger in the side lane next to the big rig as this is a potential blind spot for the big rig driver. It’s also a good idea to identify if the big rig driver is visible in their side mirror. If you can see them, it’s likely they can look back to see you. If you’ve ever driven a bigger vehicle, you know that they don’t stop on a dime. In fact, loaded semis take about 20-40 percent longer to stop than the average automobile. This means they’re going to need a bigger cushion of space between the car in front of them than an average driver would need. For this reason, it’s always a good idea to stay a safe distance away from the front of the big rig. This includes when passing the rig, make sure you’re giving it a good bit of cushion. You never want to cut it really close as the big rig may not stop in time if they’re going faster than you anticipated. It’s no surprise that bigger vehicles make wide turns. Anticipating the amount of space a big rig driver is going to need to turn can help you to position your vehicle at a safe distance. It’s common for truck drivers to utilize both the middle lane and the turning lane when in confined areas. It’s never a good idea to try and sneak into the turning lane as you may be putting yourself in the blind spot for the big rig. Instead, simply let the rig use both the lanes and take the wide turn to ensure the safety of both vehicles on the roadway and the property at the intersection. Being safe on the roadway starts with understanding more about big rigs and how they operate. Knowing what to expect on the roadway when driving near a big rig can help both drivers to better navigate around one another. Be sure to understand the above safety tips and start implementing them in your daily driving.